Does better nutrition enhance economic growth? Does better nutritional status contribute to faster economic growth? If it does, what are the magnitude and persistence of this effect? These two questions are the paramount issues of this project. If the answer to the first question is yes, and the effect is appreciable, food aid to low-income food-deficit countries (LIFDCs) and least developing countries (LDCs) will not only improve human welfare in those regions but will also enhance economic growth, so that these countries can eventually grow out of poverty. Nutrition is the fundamental condition for human welfare. Recently, sufficient food and easy access to food have been considered basic human rights. Good nutrition represents an investment in human and social capital; the solid establishment of human capital is a key determinant of household and community well-being, which in turn forms a basis for development. At the World Food Summit in Rome 1996, heads of state and regional representatives agreed to fight hunger. As the Summit resolution, all possible efforts to halve hunger by 2015 were adopted by the representatives of all states and regions. According to the Food and Agriculture Organization of the United Nations (FAO), the absolute number of undernourished in the worlds developing countries was 841 million (FAO, 1996: p. 45, Table 14). The summit underlined that fighting hunger is an important and imminent issue that is currently facing the world, and that there is an immediate necessity for international cooperation. At the same time, heads of state and regional representatives recognized that the cost of hunger - the presence of food insufficiency in a country - hurts the economic growth of that country. The fight against hunger is not only to establish food sufficiency in developing countries, but also to enhance future economic growth and development. The World Food Summit was one of the continuing efforts to achieve recognition of the efficiency cost of hunger. The resolution to fight hunger has sent a clear, strong message to all countries that hunger is very costly in terms of lost economic growth. Despite recognition of its importance, researchers have not yet fully explored the interactive mechanism that links nutrition and economic growth. In classical growth theory, the importance of saving and investment to economic growth has been understood for a long time. The recent development of endogenous growth theory has led to well-focused educational curricula. If nutrition is viewed as an investment in human and social capital, there are strong grounds for its further investigation. This paper is organized as follows. The first section reviews most of the important literature in the field. In particular, it discusses both theoretical and empirical works on how improved nutrition may increase growth, and vice versa. The literature discusses various mechanisms for how both short- and long-run benefits may derive from a labour force that has improved nutritional status. This leads to the theoretical work that is discussed later in the paper. After a brief summary of data and stylized facts, the main theoretical work is developed. First, the way in which nutritional status is integrated into the growth model is introduced, followed by three theoretical models for analysing nutritions potential effect on growth. In particular, the discussion begins with a neoclassical exogenous growth model based on the Solow (1957) type. Nutritional status cannot have long-run effects because its steady-state growth rate is exogenously determined by the rate of technological progress. However, this does not prevent us from discussing the more rapid short-run converging dynamics generated by improved nutrition. In order to achieve long-run effects, we have to resort to endogenous growth models. First we lay out the simplest endogenous growth mode - the AK model. Although this model is capable of generating long-run growth from even a transitory improvement of nutritional status, it lacks short-run dynamics. In order to achieve both long- and short-run effects, we reinterpret the Uzawa (1965) and Lucas (1988) human capital growth models with nutrition associations. The basic idea is that if a labour force with better nutrition can adopt technology more rapidly, the long-run steady-state growth rate will increase. The empirical results are then analysed. The DES regression is divided into three time-period subgroups: five years, ten years (same as Arcand in FAO, 2001) and the full 39-year period (1961 to 1999). This allows us to discern the different impacts for different time horizons. We also compare subgroups of developing countries in order to understand the cross-sectional performance difference. Arcands (FAO, 2001) results are compared with those produced by procedures that are less likely to be infected by the potential accounting identity problem. Finally, we take the feedback effect of growth rate on nutritional status into account, and both the responsiveness and the persistence of the feedbacks are recovered. The last section summarizes the papers main conclusions and discusses the policy implications. Differences in cross-country growth performance have intrigued an ocean of theoretical and empirical works in this field. Two of the most prominent schools of thoughts are exogenous growth theory and endogenous growth theory. Solows (1956) seminal work spurred the "convergence" frenzy. The original work implies "unconditional" convergence, which states that, as all countries will come to a common steady state eventually, it must be the case that poorer countries will grow faster so that they can catch up with wealthier ones. However, although the earlier work of Baumol (1986) supports this hypothesis, its results were shown to be fragile by the De Long (1988) critique. In order to take into account differences in steady states, economists started to focus on a homogenous sample, or to "augment" the conventional Solow model with variables that capture a countrys heterogeneity. Barro and Sala-i-Martin (1991) found evidence of convergence by industries among states in the United States, as well as among regions in seven European countries. Barro and Sala-i-Martin (1992) found evidence of unconditional convergence among states in the United States, and evidence of only conditional convergence among a larger cross-country sample. The conditions included initial school enrolment rates and government consumption shares of GDP. By applying measures of human capital, the population growth rate and the physical capital accumulation rate to the "augmented" Solow model, Mankiw, Romer and Weil (1992) found convergence for a panel of 98 countries from 1960 to 1985. Most regressions based on this "conditional" approach find general supporting evidence. The endogenous models began with a broader definition of capital. In addition to physical capital, this type of model usually includes a new category called "human capital". As there is no decreasing return to scale for this broadly defined capital (increasing returns are sometimes assumed), the accumulation of capital in general does not stop at a certain level, contrary to what happens in an exogenous model. Thus, the growth rate is endogenously determined. In particular, more efficient human capital accumulation results in faster growth in the long run. Pioneering work in this field includes Romer (1986) and Lucas (1988). For this purposes of this study, an exogenous model differs from an endogenous model in terms of whether or not nutritional status would have long-run effects on economic growth. If better nutrition is defined by improved physical labour productivity alone, there will be a parallel upward shift of the growth path - even if the economy grew faster in the short run, the long-run growth rate would remain unchanged. This is consistent with an exogenous growth model. However, analogous with the concept of endogenous models, is the view that a labour force with better nutrition can learn faster. If this is true, the diminishing returns that are identified under a narrow definition of capital may disappear. This would produce a growth effect on the balanced path and, as a result, the long-run economic growth rate would increase. This is discussed in a Lucas (1988) model style in the section Theory. Several recent works deal with similar issues. Sachs and Warner (1997a) summarized the current literature and came up with a list of the variables that are most closely related to economic growth. Among other commonly known variables, their list emphasizes geographical and institutional indicators and human capital measures. In particular, Sachs and Warner (1997b) attributed the slow growth in sub-Saharan African countries to poor economic policies, especially a lack of openness to international markets. They also claimed that this explanation makes the usual African dummy variable redundant. Bils and Klenow (2000) used returns on education from the labour literature to evaluate the contribution of schooling to economic growth, and found that schooling explained approximately one-third of cross-country growth differences. Hanushek and Kimko (2000) found that direct measures of labour force qualifications (such as international mathematics and science test scores) were strongly related to economic growth. More specifically on the contributions of health and nutrition to economic growth, Arora (2001) investigated the influence of health on the growth paths of ten industrialized countries over the past 100 to 125 years. He found that improvements in health led growth rates to increase permanently by 30 to 40 percent. Zon and Muysken (2001) combined a health production sector and a human capital production sector with the Lucas (1988) endogenous growth model. They concluded that, as the steady-state growth rate of the populations average level of health rose linearly, health sector productivity is as important a determinant of growth as productivity from the human capital accumulation process itself. Sachs et al. (2001) emphasized the importance of disease control for economic development in developing countries. Moreover, these authors also recognized family planning and access to contraceptives as crucial accompaniments of investments in health. In general, our findings echo this specific notion. The main research that we are revisiting in this paper was conduced by Arcand (FAO, 2001). This author considers the impacts of two measures of nutritional status - the prevalence of food inadequacy (PFI) and the dietary energy supply (DES) - on the growth rate of real GDP per capita for 129 countries during the period from the 1960s to the 1980s. Arcand reports that nutrition has statistically significant and quantitatively important effects on growth. He claims that inadequate nutrition is causing losses of 0.23 to 4.7 percentage points in the annual growth rates of per capita GDP worldwide, and losses of 0.16 to 4.0 percentage points in sub-Saharan Africa. These results are robust in a wide spectrum of econometric procedures, as well as in the critique that nutritional status measurements are widely overestimated. As a result, combating malnutrition is not only an urgent task for humanitarian reasons, but also imperative for economic development purposes. Several critiques arise from Arcands results. First, there is the accounting identity problem. Because the growth rate of per capita GDP is always equal to a weighted average of the growth rates of agricultural, industrial and other sectors GDP per capita, regression of the growth rate of per capita GDP on initial nutritional status is spurious given the high correlation between agricultural GDP per capita and the two measures of nutritional status (sufficient food and easy access to food). Second, increasing DES and reducing PFI are treated as two separate issues in the fight against malnutrition, even though the Sixth World Food Survey (FAO, 1996) makes it clear that the two measures may be complementary. 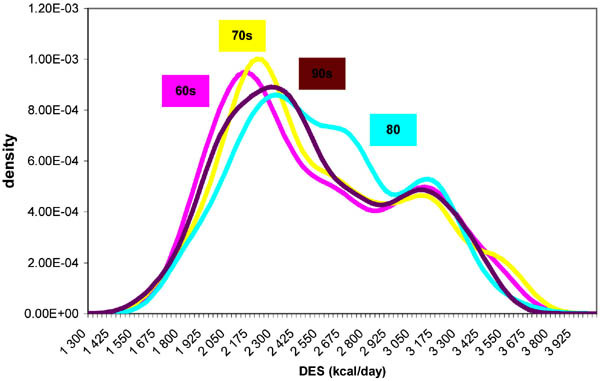 DES measures the daily energy (calorie) intake from food consumption, its unit is the kcal/day and it is recorded in terms of the national average. PFI is the fraction of the population whose daily energy intake is below a certain cut-off level. It is possible to increase DES without changing PFI; for example, when all the increased DES is distributed among the population that is above the PFI cut-off level. Vice versa, it is also possible to reduce PFI without changing DES; for example, when energy intake is simply transferred from those above the cut-off level to those below. In general, however, the expectation is that PFI decreases as DES increases. The aim of policy-makers should be to obtain the largest possible decrease of PFI for a given DES increase, or the largest possible increase of DES for a given PFI decrease. The relation between these two measures depends on how the energy intake is distributed across the population, as well as on the aid distribution system. Both of these systems are far from clear to external researchers, but we can extract useful empirical results from the data that they generate. Third, we have to remember that econometrics does not have answers to all of our questions. In particular, econometric procedures can recover only statistical relations and do not provide more useful information on the actual causality between variables, let alone on the direction of that causality. Although it makes sense that better nutrition enhances economic growth, we still need solid economic theories and models with which to formalize this relationship. Such theoretical models also provide guidance in the search for possible transmission mechanisms between nutrition and growth. In particular, nutritional status is far from exogenous, and economic growth has been widely documented to have a positive impact on nutritional status. For example, Easterly (1999) found that an increase of 1 percent in per capita GDP was associated with an increase of 538 kcal/day in DES. The evidence points to simultaneous determination, which leads to another related question: How responsive are these feedback effects? Although in theory there is a clear distinction between long-run (i.e. steady-state) and short-run (i.e. converging dynamics) growth, little empirical work has acknowledged this distinction. This might be because of the observational equivalence problem. For example, when a country suddenly grows more rapidly, if the slope of the steady-state growth path becomes steeper, it indicates a growth effect. Otherwise, the suddenly rapid growth might be a short-run blast to push the country into a higher but parallel path; i.e. it is only a level effect. As described in Solow (2000), even transitory growth can last for a long time. Theoretical models discussed later in the Theory section (p. 41) provide the rationale for both the level and the growth effects of nutritional status. Although we cannot identify what fraction of the growth increment is due to long-run effects and what fraction to short-run effects, it is still empirically very important to evaluate the impact of nutritional status on growth in various time frames. For example, in a neoclassical endogenous growth framework, given a constant annual rate of convergence, the growth rate starts high then monotonically decreases and asymptotes the long-run steady-state growth rate. We evaluate the magnitude of these impacts empirically in following sections of this paper. We used a richer data set than that used by Arcand (FAO, 2001). In particular, as well as the three observation points (1969-1971, 1979-1981 and 1990-1992) reported in FAO (1996), we also used average daily per capita calorie intake in most countries from 1961 to 1999. This allowed us to estimate more elaborate models with improved efficiency. We paired this data set with annual real GDP information from the World Bank data set (World Bank, 2001) to create the main panel dealt with in this paper. The sample comprises 114 countries (27 developed and 87 developing), including 36 countries in sub-Saharan Africa, 21 in Latin America and the Caribbean, and five in South Asia. Notes: 129 (countries) × 3 (decades) = 387 observations. Reference line = target DES (2 770 kcal/day). There is no doubt that a countrys nutritional status is closely associated with its level of economic development. For the three-year periods 1969-1971, 1979-1981 and 1990-1992, the average DES for developed economies were 3 190, 3 280 and 3 350 kcal/day, respectively, while the counterpart figures for developing economies were 2 140, 2 330 and 2 520 kcal/day. Figure 1 plots the log of real GDP per capita with DES: a dot indicates a developed economy and a plus sign indicates a developing economy. The positive correlation between the two variables is obvious. Figure 2 plots the growth rate of real GDP per capita with DES, and it seems that there is no clear correlation between them. This can be used as evidence against unconditional convergence if DES proves to be a good proxy for the initial level of real GDP per capita. Figure 3 is similar to Figure 1, but the relative inadequacy (RI) of the food supply in developing countries replaces DES on the horizontal axis. The negative correlation is once again obvious. Parallel to Figure 2, Figure 4 fails to detect any negative correlation between the growth rate of real GDP per capita and RI. Although the average difference between developed and developing countries shrank from 1.49 to 1.33 during the two decades, certain groups within the developing countries saw the difference enlarging. In particular, sub-Saharan African economies have experienced an absolute decrease in average DES from 2 140 kcal/day in 1969-1971 to 2 040 kcal/day in 1990-1992, as a result their difference from developed economies increased from 1.49 to 1.64. Moreover, the two subgroups of developing economies that used to be at the bottom of the DES chart - East and Southeast Asian economies and South Asian economies - caught up and passed sub-Saharan African economies. Since the early 1990s, the average for sub-Saharan African economies has been at the bottom of the DES chart, even though there are great varieties within the region. South Asian economies come next from bottom. We see a mirror image of this with RI. In sub-Saharan Africa, this indicator increased from 11 to 14 percent during the two decades, while East and Southeast Asia saw a dramatic decrease from 12 to 3 percent, and South Asia a decrease from 9 to 5 percent. Reference lines = horizontal: zero and mean growth rate (0.013). vertical: target DES (2 770 kcal/day). Reference lines = horizontal: zero and mean growth rate (0.012). vertical: target DES (2 770 kcal/day). Notes: 129 [countries) × 3 (decades) = 387 observations. Reference lines = zero and mean growth rate (0.013). As explained previously, RI is very closely related to the dispersion of energy intake across the population, while DES measures only the average level. Put simply, it is possible for RI to improve or deteriorate while DES remains intact; for example, by changing only the nutritional distribution. Figure 5 gives an empirical observation of the relation between RI and DES. The convex decreasing pattern is striking: an increase in DES is usually associated with a decrease in RI, and the reduction of RI is larger when DES is smaller. If this relationship reveals a social and statistic regularity that we can exploit, the improvement of average nutritional status in the poorest countries will generate a positive social effect way beyond its economic effect. We describe this relationship more fully later in the paper. Parallel to the categorization of countries into developed and developing economies, we show similar figures for sub-Saharan countries and South Asian countries (Figures 1a, 2a, 3a and 4a), for low-income food-deficit countries (LIFDC) (Figures 1b, 2b, 3b and 4b) and for least developed countries (LDC) (Figures 1c, 2c, 3c and 4c). These supplementary figures reiterate the fact that this group of countries suffers most from malnutrition. If we want to use DES and RI together, the only data set available is the one in the Sixth World Food Survey (FAO, 1996). There are 129 countries in this sample, 98 developing and 31 developed. Each country has a complete observation of both DES and RI for the three three-year periods 1969-1971, 1979-1981 and 1990-1992. There should therefore be a total of 387 observations (294 for developing countries and 93 for developed countries). However, real GDP per capita data are missing for some countries for some periods. The missing data percentage is 13.4 percent for the whole sample: 11.8 percent for developed countries and 13.9 percent for developing countries. Thus, developing countries are slightly under-represented. Since sub-Saharan African countries (39 countries) and South Asian countries (five countries) are of major interest, we separated them from the rest of the world. Sub-Saharan Africa has a missing data percentage of 13.7 percent, South Asia has no missing data, and the rest of the world has 14.1 percent missing. We conclude that sub-Saharan Africa is properly represented by the sample. We also used two other types of categorization: LIFDC (62 countries) and LDC (33 countries). LIFDCs have a missing data percentage of 12.4 percent (and the rest of the world has 14.4 percent), and LDCs have 24.2 percent (and the rest of the world has 9.7 percent). We conclude that LIFDCs are slightly over-represented while LDCs are grossly under-represented. We return to this point when discussing estimation results. Figure 6 depicts the transition of cross-sectional DES distribution for all countries during the total four-decade period. The twin-peak structure is obvious, one peak for developing countries, and the other for developed countries. From the 1960s to the 1970s and, especially, in the 1980s, the difference between developing and developed countries shrank noticeably. But this trend was reversed in the 1990s when the distribution went back to its distinctive twin-peak structure. This indicates that the nutritional status of developing countries has worsened in recent years. We wanted to use simple tools to address a fundamental question: Does higher DES cause faster growth, or should the direction of causality be reversed? Maybe the effects exist in both directions? Put another way, what do the data tell us about the dynamics of these two variables? 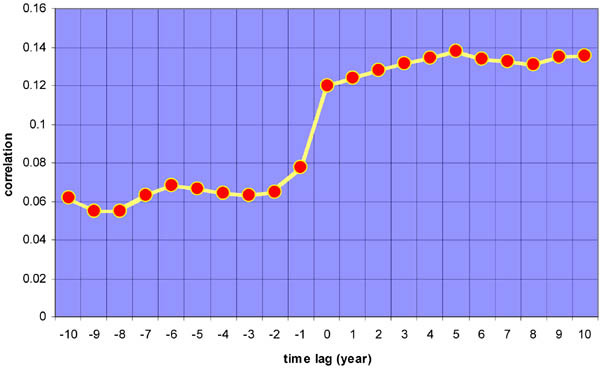 Figure 7 plots the simple correlation between log DES and the GDP growth rate with various time lags. The contemporaneous correlation is in the centre at horizontal mark zero. To the right is the correlation of lagged growth with current DES (i.e. of current growth with future DES). To the left is the correlation of lagged DES with growth (i.e. of current DES with future growth). The contemporaneous correlation is about 0.12, but the forward effect is drastically different from the backward effect. In order to describe the plot clearly, this figure can be interpreted as follows. If higher DES does cause faster growth, this effect is at its highest level during the same period as the increase in DES is at its highest level. This effect takes off quickly in two to three years. To give a quantitative example, if DES increases, once and for all, by one unit (in terms of standard deviation), in the same period GDP growth will increase by 0.12 units (in terms of standard deviation). But this effect will drop quickly to 0.08 the following year, and to 0.06 the year after that. The long-run effect seems to be about 0.06, but it takes much longer for the effect of economic growth on nutritional status to emerge. Following this procedure, we supposed that a higher growth rate does increase DES. If a one-unit increase in growth rate (permanently) increases the log of DES by 0.12 units in the same period, the next five-year log of DES will grow gradually, and then settle down at the long-run level of about 0.14 units. The bottom line is that these are indeed long-run effects in both directions, and the effect of DES on growth shows up far more quickly than the effect of growth on DES does (although it also decays more quickly than the latter effect). On the contrary, economic growth seems to contribute to DES in a persistent way. Put another way, DES measures the average energy intake of the population, PFI measures the prevalence of malnutrition, and RI measures the intensity or severity of malnutrition. DES is µM, which in turn is positively correlated with µm. As a result, higher DES increases the average effectiveness of the labour supply. PFI is f(mc), where f(m) is the normal cumulative density function and mc = lnMc. Given DES and mc, only a decrease in can cause a decrease in PFI. Thus, a decrease in PFI will also increase the average effectiveness of the labour supply. RI is positively related to PFI and negatively related to DES, according to Equation 3. Thus, a decrease in RI will increase the average effectiveness of the labour supply. In this section we use a simple neoclassical exogenous growth model to show how the average effectiveness of the labour supply, E, may affect the growth rate. In such a setting the long-run steady-state growth rate is determined by the exogenous rate of technological progress. As a result, higher E will not change the steady-state growth rate. However, E can still affect short-run growth by altering the gap between previous and new steady states. The standard result implies that the larger the gap, the more rapid the growth. where subscript zero denotes the initial time period, i.e. t = zero. Equation 15 indicates that an increase in E will parallel-shift the steady-state balanced growth path of capital per labour unit by the same proportion, while Equation 16 shows a more than proportional shift in the path of output per labour unit. Even with the constant convergence rate and the steady-state growth rate, the short-run growth effect can still be quite appreciable with common parameter values. For example, assume that g = 0.01, n = 0.01, d = 0.035, and a =1/3, the convergence rate ë is equal to 0.04, and the steady-state growth rate of output per labour unit is 0.015 (i.e. 1.5%). Given a one-off 10 percent increase in E, the growth rate of output per labour unit jumps temporarily to 1.9 percent, and then decreases to asymptote the steady-state rate of 1.5 percent over the long run. When there is a convergence rate of 0.04 (i.e. 4 percent), it takes about 18 years to close half of the initial gap (see footnote 7). As a result, the growth rate will stay above the steady-state level for an extended period of time, even with a modest increase in E.
Although the neoclassical growth model is capable of generating higher short-run growth from better nutrition, it is more interesting to investigate whether the long-run growth performance can also be improved by even a one-off increase in E. For this purpose we introduce the endogenous growth model. We first use the simplest version, i.e. the AK model, to illustrate the general result, and then we move on to a more specific model of human capital accumulation. The first example of including undernourishment in a neoclassical or AK endogenous growth model is in Arcand (FAO, 2001), and the following two sections are based entirely on that work. Equations 18 and 19 obviously imply that both Yt and Kt are growing at the same rate as Ct on the balanced growth path. Equation 25 implies that even a one-off improvement in nutritional status will have a permanent effect on the long-run growth rate. However, although the AK model is convenient for generating the permanent effect from temporary changes in E, it lacks short-run dynamics. In this model, it is easy to prove that Ct will always be a constant proportion of Kt. Thus, if at some future time t E jumps up permanently, Ct will simply change from the old proportion to a new proportion of Kt instantaneously, and then move along the new faster growth path. This implies that the balanced growth paths of Ct, Kt and Yt will show kinks of the same degree at the time of t, but the ratios between them will remain constant. Since at least conditional convergence is a widely accepted fact, this is the major failure of the AK model. There is no doubt that better nutrition improves physical health. Several researchers have found evidence that a healthier labour force can increase productivity. As observed by Grossman (1972), the positive contribution of good health to labour productivity is of particular importance to economic growth. Although it is understood that better educated people learn faster (see for example Lucas, 1988; and Barro, 1991), it can still be argued that being healthy is just as important to economic growth as being knowledgeable is. When resources are limited, it seems that knowledge and health substitute each other, but from the perspective of economic growth they act more as complements. In this section we introduce a nutrition index (as a proxy for the healthiness of the labour force) into the standard human capital accumulation framework and obtain a new interpretation from the model. where A is the total factor productivity in regular goods production, while B(1-u) is the gross marginal product of existing human capital in new human capital production. We believe that nutritional status may affect both the marginal product parameter B and the human capital depreciation rate d. That is, B is an increasing function of E, while d is a decreasing function of E. As already mentioned, a healthier labour force will learn more quickly, thus human capital will accumulate more rapidly. This is equivalent to an increase in the parameter B. For example, better nutrition can enhance the contribution of schooling to human capital accumulation. Moreover, better nutrition may also reduce the human capital depreciation rate d. Research has shown that countries with better nutrition usually have longer life expectancies. Longer life expectancy basically extends the time horizon within which the benefit of human capital accumulation can be harvested. As a result, better nutrition provides stronger incentives for human capital accumulation. Thus, an increase in B or a decrease in d can be achieved by better nutrition, as already argued, and will increase the steady-state marginal product of physical capital and the long-run growth rate. For empirically reasonable values of r, d and g, j should be positive. Hence, Equations 37, 38 and 39 imply that an increase in B will reduce w* and u*, but increase c*. The intuition behind these changes is obvious. Higher B makes human capital accumulation more appealing, thus a larger fraction of human capital is devoted to the second sector. As a result, human capital temporarily grows more quickly than physical capital so the ratio of drops. The ratio is higher, mainly because the human capital effect dominates over the physical capital effect. Unlike the AK model, the current framework is also capable of generating desirable transitional dynamics. The detailed derivation is tedious and of little interest to this project, so we report only the main results in the following. Furthermore, numerical results show that the relation between the growth rate of Y and w tends to be U-shaped, with the minimal growth rate of Y achieved at w*. That is, whether w starts below or above w*, the growth rate of Y will start high and then gradually decrease to g*. This implies an overshoot of the short-run economic growth rate as a result of an increase in B or a decrease in d.
To summarize the general results in this section: an increase in nutritional status can increase the economic growth rate permanently, and the short-run effect will be greater than the long-run effect. Xiaojun Wang is Assistant Professor of Economics at University of Hawaii. Kiyoshi Taniguchi is a development economist with the Agricultural and Development Economics Division of the FAO. The authors are indebted to Drs Paul Winters and Sumiter Broca for their discussion and inspiration. They also acknowledge Dr Kostas Stamoulis for his warm understanding in pursuing this research further. The authors have sole responsibility for any errors or omissions. One main counterintuitive implication of the AK model is that it contains no convergence, and at least conditional convergence has been widely accepted as an empirical regularity. 98 developing countries and 31 developed ones. These procedures are supposed to correct for unobserved country-specific heterogeneity, measurement errors and endogeneity. This was brought to our attention by Dr Sergio H. Lence, who we thank for providing a detailed explanation of the problem. The so-called Granger causality is no exception. about 35 years to close half of an initial income gap (see Romer, 2000: p. 25). Each indicates the average value of the variable for the three-year interval. We excluded countries with populations of less than 1 million in 1999. FAO, 1996: p. 11, Table 1. Each observation is a country-decade. For example, Italys DES for 19691971 and its average log real GDP per capita for 19701979. The same definition applies to the growth rate of real GDP per capita. Real GDP per capita data come from the World Bank World Development Indicators 2001. FAO, 1996: p. 56, Table 17. Adjusted R2 = 0.91. N = 294. This result implies that, evaluated at the 1990-1992 level of DES, an increase of 500 kcal/day will reduce RI in sub-Saharan Africa by 8 percentage points, and in South Asia by 4 percentage points. Lucass (1976) critique shows that some statistical relation/regularity cannot be exploited once the public has rational expectation. This renders government policies ineffective. Missing data for developed countries are mainly due to the reunification of Germany, the separation of Czechoslovakia (into the Czech Republic and Slovakia), and the separation of the former USSR and of Yugoslavia. World Bank data do not have observations for the 1970s and 1980s. For the 1990s, we match Czechoslovakia with the Czech Republic and the former USSR with the Russian Federation. As all measures are at the per capita level, this seems to be a proper approximation. The density function is obtained by the kernel smoothing technique (see Ward and Jones, 1995). Instead of causality, the correct term is associated. We also ignored possible feedback effects. We ignored the role of expectation. In a permanent income/life cycle framework, the expectation of higher future income growth may prompt an increase in DES today. Vice versa, the expectation of higher future DES may prompt faster income growth today (for example, demand for food is expected to increase, which prompts firms to produce more today). See FAO, 1996, for detailed descriptions of the derivation of a populations energy intake distribution, the various types of cut-off point, basal metabolism rates and activity multipliers, etc. In order to derive a better exposition, we did not consider the biological boundaries of M. For example, the value of M cannot go below the survival level, and it also has an upper boundary beyond which undesirable physical conditions (such as obesity) occur. We assumed that the distribution is not truncated in any way. We treat an increase in daily energy intake as meaning better nutrition, although this is obviously not always true. For example, in some developed countries excessive calorie intake has caused obesity. However, since we are focusing mainly on developing countries, especially those with food shortages, this problem is of less importance.